Oh dear, well one of my new years resolutions from the beginning of 2012 didn't really stick. My intention was to try and post on here a bit more, but I've actually written fewer posts than in 2011! I'll try again for 2013 but I'm not promising anything this time! Over the last 12 months I've probably made fewer tack sets than ever. As far as full sets go, I've made one huntseat set, one classic scale show set, one western set, one Australian set, a pebbles scale western set and then a couple of bridles and other small accessories. So, pretty varied really, but only 5 sets over 12 months. I couldn't do anything for January or February as we were still waiting for our container to arrive, so maybe my annual rate is closer to about 6 sets, or 2 months per set. This is useful to know, and it's the kind of time frame I should bear in mind when planning next years workload. Right now I have three things on the books: a bridle, a Draught horse presentation set, and a full cross-country set. More variety - I like it. I also have a few updates on the website to do and facebook as well. The Yahoo group is really taking a backseat. Updating four different things seems pretty inefficient so I will be discontinuing that group shortly. Blogger works far better for announcements, and facebook works well for random snippets and in-progress photos. I have really been lacking any sort of motivation since the Ultimate Gold 2 live show on the 9th (yes I should do a blog post about that...). I had 5 days off over Christmas and yet didn't lift a finger in the studio. It was nice and clean, fairly inviting, but I just didn't fancy making anything. Lots my mojo a little, but it doesn't help the temperatures have been at least 36C each day. Big heat is a recipe for disaster when it comes to Lauren's motivation. So I didn't push it. I laid on the sofa watching cooking shows and property shows, and looking after my friend's dog Ted who is a pretty cool Cocker Spaniel. He's the only dog I've ever met who likes swimming in figure of 8's at the dog pool. I've also been going and feeding my friend Linda's 4 cats, two of which are stray kittens she has taken in and cared for. They are timid little things but after a week of going round I am at the stage of being able to pet them both. It's so nice being around animals again, they have such a soothing influence. Hopefully it won't be too long before we have our own best friend in the house. I'll sign off for 2012 by wishing everyone a fantastic New Year! Here's a random picture of a polo pony playing at Polo on the Beach, Cornwall 2011. Leave me a comment if you'd like to see more pics from this event! For my upcoming live show, I have been researching a little known equestrian sport that I think will e a good match for one of my standing models. I recently bought my Wico resin as an unpainted body and asked Sherry Clayton to paint him up for me. She did a great job and painted just the right amount of sabino markings. I'm not totally decided on a breed but he'll be something along the lines of Gelderlander, KWPN or Holstein, I think those three breeds allow sabino. Anyway, he does look rather nice with some of the blue accessories I have. I made the bridle years ago for an Arab I have, but who has a broken ear right now. It's made of some kind of plasticy lace, which I remember being a real pain at the time but has held up well, none of the bonds have broken. I do have other colours of this stuff too so one day may explore other possibilities with it. The whole bluey theme would go well with some kind of endurance set up, but his pose isn't exactly very active. I suppose he could do a vetting scene but I would need more dolls for that. So I looked into Le Trec. Now this is a sport I would definitely do if I had my own horse! It consists of three main phases: orienteering on horseback (POR), control of paces (CoP), and the cross-country/obstacle course (PTV). The sport has French origins which explains the acronyms used for each phase! It was originally designed as a way to test equestrian guides in the horse tourism industry. The POR can be up to 12km long at the lowest level, up to 40km at the highest level. Riders get a limited amount of time to trace the route onto their own map, and then ride the route starting with 240 points. Points are knocked off for missing checkpoints, getting the route wrong, etc. The CoP is carried out over a marked out section 150m, where they must demonstrate control of the various paces, for example cantering the course as slowly as possible whilst not breaking gait. The PTV phase is probably the most interesting from a model horse showing point of view. The course comprises 16 obstacles, each of which are judged, and these are a mix of what you may find on a cross-country course or a trail course. Typical obstacles include crossing a bridge, small jumps, opening/closing a gate, going up and down staircases etc. The one that caught my eye, with Wico in mind, was the immobility obstacle. Trec Ireland has great data sheets on each obstacle, particularly useful for those of use who like lots of good documentation. The immbility obstacle requires the rider to walk into the centre of a 2.5m diameter circle. The rider then has 10 seconds to position the horse and release the reins completely, laying them on the horses neck. Once the reins are released the timer is started and is stopped when either the rider moves to pick up the reins or when the horse leaves the circle. Full marks are awarded if the timer reaches 10 seconds. Deductions occur for interventions, brutality or dangerous methods! So, my Wico looks pleasantly relaxed and at ease, and will look great inside that circle. This weekend I made up a base which is pretty simple, and will use small cones to demarcate the circle, using a plate as a template. The flags are secured in small holes in the base. There is also a dismounted immobility obstacle, where the horse is led into a 4m circle and left there whilst the riders leaves the circle and stays outside another 8m circle. The rules are basically the same but I chose the mounted version as it takes up less space, and I don't have to deal with trying to get a doll to stand up! Overall I'm pretty happy with the idea of it all. We'll see how it goes down at the weekend! Another set that has taken me a while to complete, it was delayed due to my other old orders. 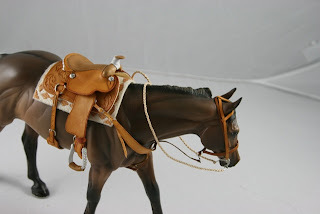 Sharon asked for a set similar to the first Working Western set I made in early 2011. I have done a different carving pattern, and used slightly different colours for the seat and pommel assembly. This also used a TWMHC tree as opposed to a Rio Rondo tree, so some modification of the patterns was required. Sharon also loved the resin this saddle set is shown on, so I sent them both off to live with her on the other side of Australia. She let me know that this combo won Reserve Champion in performance at the recent Canberra live show. 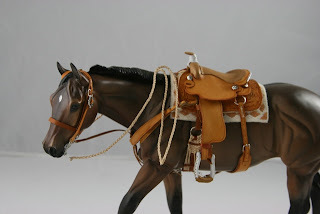 One of my recent orders has been for a snaffle bridle to fit the Breyer Classic scale Haflinger pony. I didn't have one of my own so decided to order one, as I knew it would be a bit dodgy doing this one from measurements. The cheapest way to get Breyers here in Australia is to buy them from the UK! It takes a week or so for them to arrive but then again the domestic post usually takes that long anyway. I also bought a Classic scale warmblood (the Selle Francais), and a Heartbreaker and Valentine set (or whatever they're called). I don't generally pay too much attention to Original Finish models unless I know I'll need the mould for tack fitting purposes! I do enjoy customising them so they will all become fodder for that. I like the resculpt part but not really the painting part so I'll get someone else to do that! For the pony, my idea was to get rid of the huge mane and forelock to make her a bit more tack friendly. When she arrived, it's pretty clear she's not true classic scale. Much bigger in fact. I think she'd make a good small pony in Traditional scale. 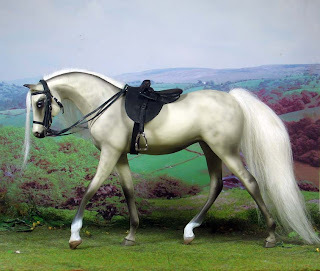 Anyway, just as I was about to start the bridle, I was mooching on MH$P as one does, and came across a gorgeous customised Haflinger by Frances Stevens. Just had to have her, as she was almost perfectly in the image of what I had intended for my original model. She had cute little braids, and a very pretty colour which any little girl would adore! She arrived last week and I got the bridle finished at the weekend. She made the bridle fitting a lot easier! I made two browbands for the bridle, one to keep intact, and the other can be chopped up if the owner needs it to fit around the forelock on the original model. I was very happy yesterday to finally put Caitlin's Australian set in the mail to her! Overall I was really happy with how this one turned out, and along the way have found some cool new supplies. The best discovery was bookbinding kangaroo leather from Packer Direct. They had a sale on and I purchased 4 skins, for $15 each. I would say each skin is about 5 sq.ft., so that was a pretty good deal. I ended up with skins in black, whiskey, brown and brandy. The black and brandy are really nice colours, the brown and whiskey not as nice. But it re-dyes very easily so all of it will be put to good use. For this set I used the brandy coloured hide but went over it again with All-in-One Cherry Chocolate to get a deeper colour. The All-in-One also conditions and seals the leather and this particular leather went exceptionally soft and shiny. It also brought out the tooling really nicely. One thing I did learn is that it's much easier to apply the dye on a larger piece, then cut out the patterns. Most of the hardware on this set is cast. The bridle buckles are particular favourites of mine and are the swedge type buckles made by Sulser Saddlery sold through The World of Model Horse Collecting on ebay. Caitlin requested a purple and lime green colour theme for the girth, as she has lots of accessories to match. I'm sure it will certainly stand out! The stirrup leathers are fully adjsuatble much in the same way as western fenders, with the buckle near the stirrup but concealed between the folded leather. I have a couple of blog posts to write up so I'll start with the first one I should have done 6 weeks ago! I went to the Ultimate Gold Live Show in July, my first Australian live show. All in all it was pretty similar to shows in the UK, the only major difference being the Artist Resins being combined with Customs, and having one judge judge a whole division. I have too many resins and customs as it is, so having a combined section meant I had to really think about who to take. But it's a good excuse to sell some of my customs as they won't get shown as much and I do find their finishes a bit more delicate than resins, especially when it gets warm. Anyway here are some pics, apologies for the wonkyness of them! Enjoy! First for Sundance, painted by Amanda Greaves in her breed class. She also won the Mini Paint Pattern colour class too! My handsome Gomez resin won the Other Pure Breed class. He also got a 3rd in the grey class and 5th in the traditional repaint class. Things have been very quiet on here, I do apologise! But I have been somewhat distracted by the amazing pictures from the London Olympics. I've mainly been watching the equestrian events and these have been interspersed with athletics, tennis, rowing and hockey. I am a hockey player so feel I should be watching that! 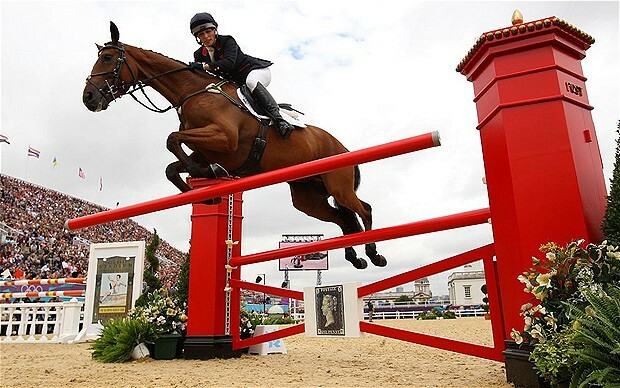 I have been blown away by the success of Great Britain in everything but especially the equestrian events. Golds in the team Show Jumping and Dressage are outstanding achievements for a nation that traditionally has never been classed as one of the big guns in these events. Moment of beaming pride now over! The pic is of Zara Phillips (not taken by me!) knocking a pole during the 3-day-event. I just love the jump, hoping at some point to re-create it so I've added it to my long list of projects. This is a bit of sneaky post before I get to the live show reports. Equorum models in the UK have just listed a lovely set for sale, including a customised Arab model complete with black leather side-saddle and double bridle made by yours truly. They are about 1:10 scale approximately and all the leather is hand cut. The tack is part of my Equorum range of tack which can also be ordered separately through the Equorum website. I have been really busy over the last few weeks. Last weekend I attended my first Live Show in Australia, the Ultimate Gold live show hosted by Stacey Crowley. So I will be writing a couple of posts dedicated to that. But before the show I managed to finish a couple of orders, including two sets of boots for Stacy Quick and Stacey's Morgan bridle. Stacy's first set was exactly the same as some I had made previously for her. They were for her CM Newsworthy model to match her show jumping set. The second set were a set of four protective boots for a steeplechasing set up she is working on. To save her having to fiddle around with buckles or studs I experimented with magnets for these. The results can be seen below on my Atom resin. They feature stitched on striking pads as I've never had much belief in glue when it comes to striking pads. At least by hand stitching I know they're NOT going to come off! Overall I was pretty happy with the design of these boots and they'll suit cross-country too. I made a set in black leather as my donation to the Ultimate Gold live show and peeps there seemed pretty interested in the magnetic closures. They take seconds to take on and off and the straps have much less chance of breaking or tearing. 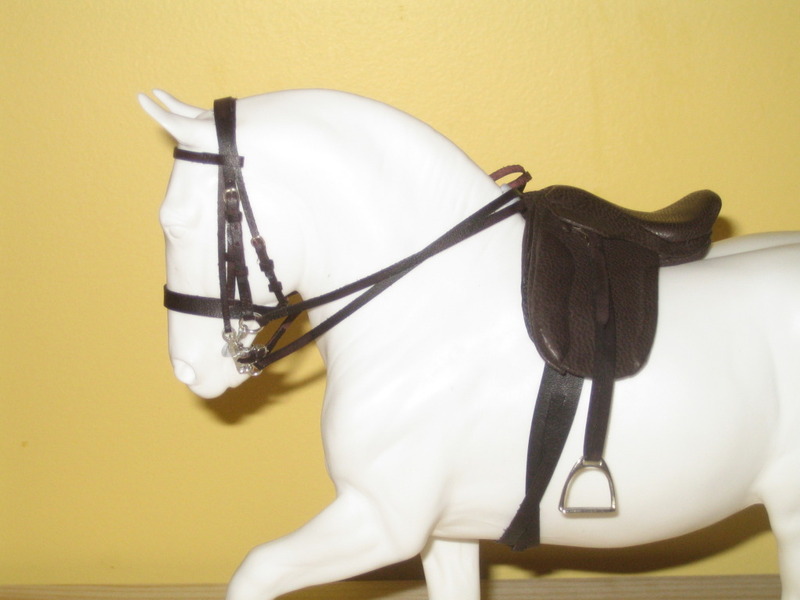 Next up was Stacey's bridle for her Darcy resins. I had sworn I had ordered the bit for the bridle months ago but couldn't find it anywhere, so quickly ordered a new one. Luckily it arrived the day before I left for the show so I was able to finish it off. It features a fancy blue browband and noseband with rolled black leather edging. Finally I am starting to feel like I'm getting on top of my orders. I still have some that are long overdue like the Australian set, as well as concurrent Equorum tack orders, but the light is just peeking through at the end of the tunnel. My books will be closed until these orders are finished and will probably stay closed for a few more months as my stress load at working will be increasing! In the next few posts I'll have some fun live show pics and results, everyone needs a break from tack once in a while! Finally we managed to find time to work on the tack box that I featured in a blog post a while back. That was well over a year ago, and for my birthday this year I persuaded him to help me with it. I don't think his heart was in it - if I had left it totally up to him he would have ruined the box three times over! Lesson learnt! It still needs some work. I may switch the handle round to the top, and try and add something in for bridles. For the latter I'm not sure whether to put the hooks on the sides of the main box, or on the inside of the door. To make the saddle racks we just used a strip of wood, cut into 4 lengths, drilled holes in that and then glued them into the box. Then the dowel sections were glued into place. We didn't have quite the right drill bit so some of the holes are a bit wonky, but they seem nice and sturdy. I think some elastic bands may be the way to go to keep the saddles in place. Eeep! Didn't realise I had so much tack of my own! This is totally un-related to tack making, but it does explain the month of little posting during May. My boyfriend/fiancé person and myself trotted off to the USA for a much needed holiday. We took 3 weeks off and arrived in Las Vegas in time for my brother James' wedding to Jessica. Then we drove over 3000 miles on our way around about 9 National Parks: Grand Canyon, Mojave, Sequoia, Kings Canyon, Yosemite, Ancient Bristlecone Pine Forest, Capitol Reef, Bryce Canyon, and Zion. That gives you a rough idea of our route! Suffice to say we had a wonderful time, camped out most nights in our $29 Walmart tent, and have seen a couple of our must sees! Before I left for my holiday in mid-May I managed to finish Karen's show set for her Roundabout resin. This is a terrible photo of it. I have taken some more but they're on the other computer, they'll go on the website once I've edited them. This set has also featured on Jennifer Buxton's Braymere Custom Saddlery blog in the performance reports from the Springamathing Live Show a few weeks ago. It won first in English Pleasure and Other English, and came second in English Trail, and topped off the day by coming Reserve English Performance Champion. The set was worn by a handsome palomino Roundabout resin painted by Karen herself. Well done Karen! I have lots of things to write about so you can expect a few more blogs from me very soon. Next one will feature some holiday snaps! This picture just about sums up the extent of my productivity this weekend. I managed to cut out all the remaining calf pieces I will need to finish the Roundabout and Cerridwen sets. In the foreground are all the pieces for Cerridwen's bridle, stirrup leathers and straps for the girth. Roundie's straps are off the camera shot, drying. I used Eco-flo Dark Mahogany for both sets and really like this colour. There has been a delay with the saddles. I bought a dremel recently and one of its main uses will be to drill tiny holes in my saddles, to put the reinforcing pins through. It has to go through multiple sheets of leather and thick brass. I did them by hand before, with an awl, but the tree would always end up being bent a little and I had to work hard to get it back into shape. So, I ordered the drill bits and when they arrived I was itching to try them out. Then realised I needed a smaller collet for the dremel (that was one of those hand-slap-on-forehead moments, doh!). So, the bridles will now probably get finished before the saddles whilst waiting for the collet set to arrive! What you can't see in the photo is my lack of productivity with the Australian set. I cut and carved the pieces and dyed them, which I shouldn't have. I should have tested Java brown a bit more thoroughly instead of using it on these pieces. I think Java brown is probably the ugliest brown dye I have ever used! Totally the wrong colour. So, this week I'll be cutting some more leather and trying out yet another new dye. I'm hoping the Eco-flow All-in-one Chocolate Cherry will do the trick. The pieces I dyed Java brown will not go to waste, I'll dye them dark brown or black and make another Aussie set to sell later in the year. There are a couple of other interesting things to have a look at on my work table. My wooden draws from Ikea at the back have been mine since I was about 8 or 9 years old. I really wanted to paint them but never got round to it. I did paint another Ikea wooden box which I also still have, in all kinds of animal skin patterns which still looks pretty cool. It holds my polished mineral specimens! Next to those are a set of 16 plastic boxes which hold all of my hardware: bits, stirrups, buckles etc. And next to that is my pinboard which constantly reminds me how many orders I have to do, and keeps the current projects safe in the plastic cups, I think I stole that idea from Anna Kirby! In front of that are two models which have little reason to be on the table. The newsworthy is there as I need his legs for some boots but they're still a few weeks away. And then there's my Gaspar Destiny resin in a classic tack set by Des Corbett. He really has no reason to be there! Finally this picture reminds me I have to give Cerridwen a hot bath. During her trip to Australia she must have been in an awkward position and her near fore developed a bend. That's what a 3 month delay in shipping does for you! Sorry it's been rather quiet from me of late, things have been very busy around here! I have finally fully sorted out my 'studio' space, and have made some good progress on a couple of tack sets. Both the Cerridwen hunt set and the Roundabout show set are at the same stages, they just need pinning and then have the panels attached. I really want to get those two sets finished before my holiday in May. I took some photos of them this morning but they are appalling even by my standards so I'll try and get some fresh ones after work tonight! It's starting to get dark quite early here so soon I will have to wait until weekends to do any photography. The third set I'm working on is patient Caitlin's Australian set. 7 months ago I made the saddle, got the colour wrong and only now have just cut and tooled the flaps. I dyed them this morning, and should be able to assemble it at the weekend. I think this set will be finished early June on my return from the USA. I'd also like to get a donation bridle made for a show that actually took place last year. Stacey won it and has been very patient. In actual fact I will be going to Stacey's next show in July, which I can't wait for! It will be my first Australian live show and my first show in over a year. Hopefully I will pull my finger out and make the donation for THAT show before July! Each model has their own sheet and the points from photo and live shows are added and it gives me sub-totals for various categories. Should make the end of year awards a breeze. And it will hopefully provide motivation to sort out my TOPSA and MEPSA entries as points from all shows count. Tonight I'm going out for dinner with the girls. We're all from the UK and one of us is leaving town tomorrow. She and her partner have been here for 5 years, they arrived the same time as we did the first time. I commend them for managing to stay so long but I'll still be sad to see them go. And another one will be following her in a few months. But that's life in such a transient mining town and I know one day in a few years that will be me again too. But I'm enjoying my job and enjoying having the extra cash so can't complain really! Poor Angela has been waiting for a crupper from me for about 2 years now. She kindly fixed up two of my models painted by her after they suffered from an attack from some bubblewrap the last time I lived in Australia. In return she asked for a crupper to match the endurance set I made for her a year or so previously. I have no decent explanation of why it has taken me so long to make this small item, probably two more international moves had something to do with it coupled with my forgetfulness! Anyway last week to kick off my tack making in 2012 I did it! In fact I did it twice. The first one I made from some lace but it tore so easily when I tried to do up the buckles. So I took the hardware from that one and re-used it with some hand-cut leather strips. I often find this with lace - it is very dry compared to hide leather and is often much stiffer. Anyway here it is, not much but it will complete the set. I'm also going to make Angela an additional bridle to try and make up for it! I have also made some good progress this weekend on my saddle orders. All 4 trees are now complete and this afternoon I'll cover them with leather. Then it's a case of cutting, dying and finishing all the flaps and skirts. I think I'm on track to get all these sets, plus three more bridles, by mid-May when I'm off to California, Nevada and Utah for a much needed holiday! The website has had a page updated, yey! Specifically the commissions page has been updated with details of all my outstanding orders. Given my 3 week holiday in May I am hoping to get all of these done by the end of June. I think that is an attainable target given my historical pace! The crupper I have owed someone for years now, and feel incredibly guilty about letting this little one eternally slip away. It's only a crupper! So that one is definitely first on the list and in theory will only take half an hour. Then I owe a couple of artists some tack sets in exchange for copies of their sculptures which I have in hand now. I'm going to really enjoy the Roundabout set and ambitiously might try to make 2 at the same time. The Australian set was half finished (see previous posts) but I'm having to start again on that one. And the bridles will slot in somewhere. I will actually start by making all the required trees at once. So one hunt tree, two classic Roundabout trees and an Australian tree. I'm going to set aside some time this Sunday to work on those. The last three slots there have been booked in the last week. The boots shouldn't take long, the Western set will probably take the whole of June, and the Vaquero set is something I've been meaning to make for myself for the last year. I have the horse and the doll, so no excuses! I will also be taking on orders for Equorum tack. This doesn't take too long to make and isn't as intense as my normal work, so provides a welcome change from detail detail detail! Well, I've unpacked and inspected all the resins and customs, and the news isn't too good unfortunately. and major stickiness issues with some of the customs. The stickiness isn't too surprising given how long they've been cooped up in a hot shipping container, so it wasn't a huge surprise. But I've been trying to figure out why some go sticky and some don't. This classic warmblood has had issues in the past when wrapped in sheet foam, I knew bubblewrap wouldn't be good news so tried paper. It stuck to him, so once the sealant hardens up again I'll have a go at gently removing the paper. I think I can fix the tail and the legs (one on a small Daire resin and the other on a mini), and have a go at the ears. Other damage is beyond my competency. On the customs, where the sealant has softened in the heat they have been very vulnerable, and some have a few rubs and dents here and there. Having unpacked all of the non-minis, I was actually a little overwhelmed by the numbers of them and this has confirmed with me that I need to thin down a bit! I'll be listing resins and customs for sale on my website, here, and MH$P. Overall the experience has made me feel the need to cut back - I'd rather change around my collection more often so some guys who've been with me for 5+ years will be looking for new homes. If you see anything that interests you in the above photo then let me know. There are some I won't sell (Gomez, Atom, Darcy, Hazel, grey Valor, Memphis Belle, American Graffitti), but the others I will consider offers. This week is a very exciting one! That's because tomorrow, our stuff arrives! It's been 4 months now since it was all packed up in Cornwall, then it sat there for 8 weeks whilst our sponsoring company faffed around and delayed payment. It includes everything from our house in the UK: furniture, clothes, kitchen stuff, books, music, you name it. And of course my models. There is a whole room waiting for them! We have shipped our things internationally three times before. The last time was the most successful in terms of damage to resins. I think I had just one ear break. Before that it's always been multiple breaks. So I'm hoping my packing has improved and I won't have any. Time will tell. Well, I had a lovely Christmas and New Year here despite the heat. 40C degrees a few days prior to Christmas really did not get me in the festive mood! And last night at about 6pm we had a rather nasty storm here and it was the closest I've come to being struck by lightning! We were outside readying the BBQ and watching the galah's having a shower on a nearby power line pole about 50ft away from us. Next thing - Crack! Bang! Sparks everywhere! The pole was hit! The birds all disappeared and did not return for the rest of the evening! We did actually check to see if any had been killed and were lying on the ground, amazingly none were. I've been pretty mopey this morning as per usual, New Year is an anti-climax and nothing really amazing happens. I'm still waiting for all my stuff to get here, the ship is due into Fremantle on the 9th of January but we've heard that the workers at the port have been on strike. So maybe we'll get our stuff by the end of January, who knows... I just hope they don't get snarled up in customs any longer than necessary. the last few months. One is this super-cute Equorum shetland in mouse dun. He has a double mane which lies on both sides of his neck, in very soft mohair/silk mix. Next is this lurvly Leggs resin sculpted by Liesl Dalpe. She's been painted by Deb Brown of the UK, who is a really consistent and reliable painter. I love the chilled out expression on this mare and Deb has created this gorgeous caramel colour with a dainty blanket. And last but not least is a further addition to my Savage collection! This is the Babysitter, sculpted as a young Thoroughbred mare but I think she could be a couple of different breeds. Again Deb Brown painted her as a rich chestnut which is slightly washed out by the flash in this picture. One or two more will be arriving soon, particularly a couple of LB scaled resins - I'm becoming more and more attracted to this scale and am keen to start seeing how my tack making skills are at this scale - haven't made anything small for a while!